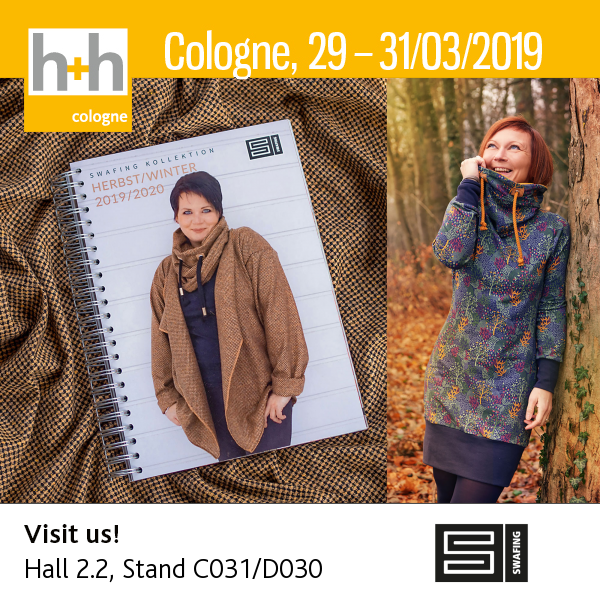 Exclusive fabrics for h&h cologne 2019! It’s that time of year again! cologne, here we come! 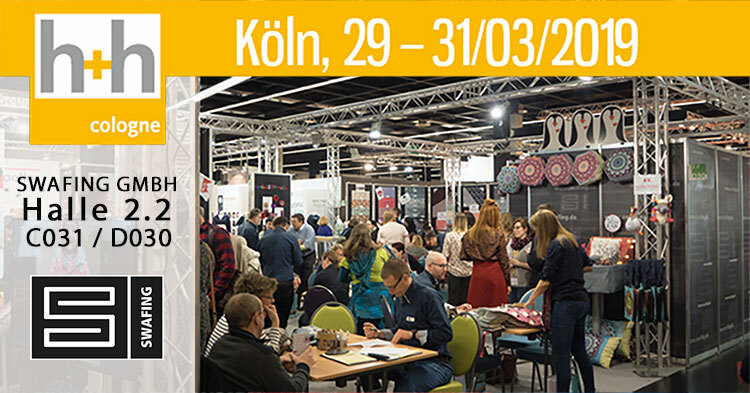 You are cordially invited to visit our booth at the 2019 h+h cologne International Trade Fair for Creative Handicraft & Hobby Supplies, March 29th-31st. Come find us at Booth C031/D030 right in the center of it all in Hall 2.2! Be sure to check out our many fair highlights, many of them available exclusively for pre-order at the h+h cologne! 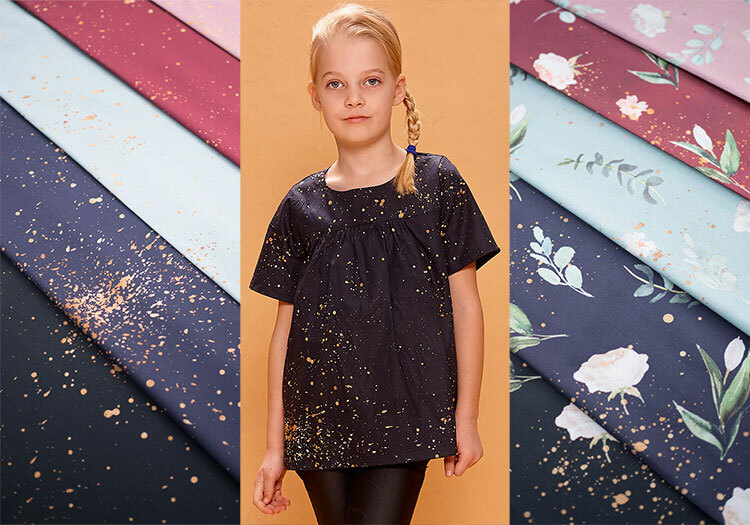 2019 is bringing you a variety of fashion fabrics like no other! Instead of just one or two trends, we are presenting a wide array of fashion choices and directions for you to find just the fabric to create the look that is a true reflection of you. 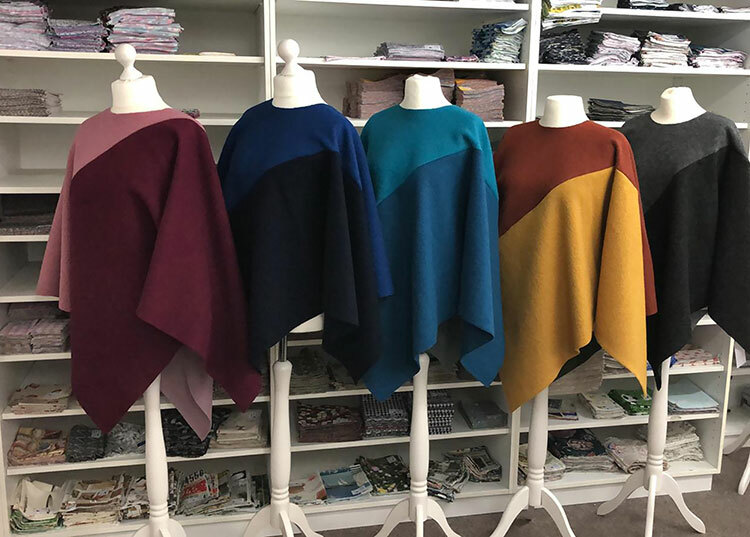 Not only do we have a wide array of fashion design directions on offer, but an incredible selection of fabric varieties as well: Flowy viscose wovens, knit jacquard jerseys, tweed suitings, woolens, activewear Lycra, as well as our famous sweatshirt and knit jerseys. More Designer fabrics than ever bevor! lycklig design, bienvenido colorido, Cherry Picking, Lila-Lotta, Jolijou and byGraziela are coming to you with fresh, fabulous and functional new design! 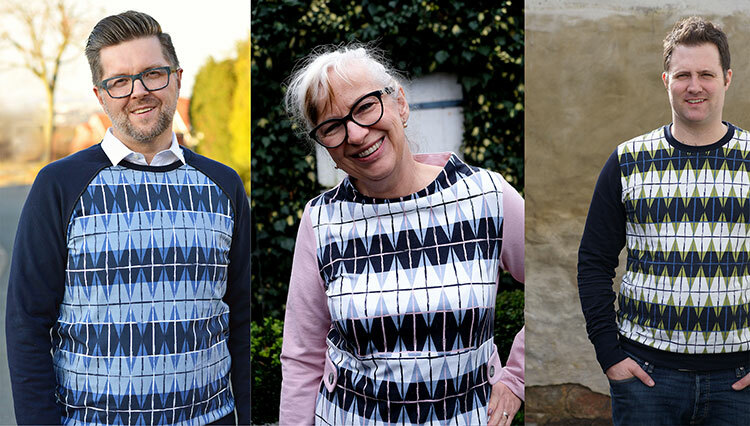 lycklig design – Wavy Stripes and more! byGraziela „Blätter Sweat“ is back! 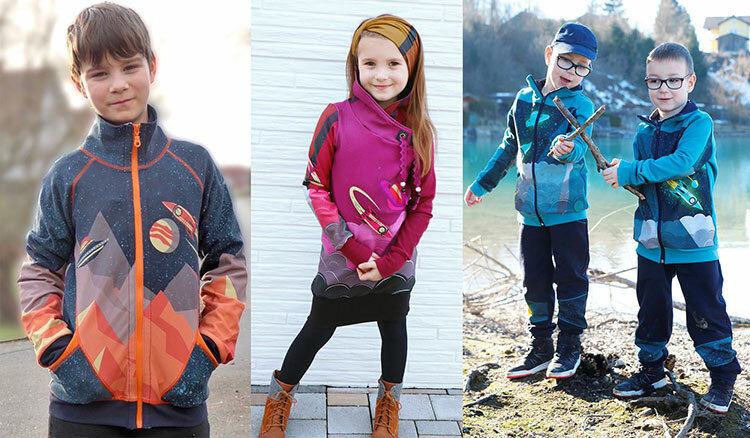 Sweatshirt fabrics for Fall and Winter! Some of the highlights presented in this newsletter may be ordered only during the fair in Cologne! We will not be accepting any orders for these fabrics by telephone or in our onlineshop. Should we have any leftovers from the h&h cologne 2019, those may find their way into the Swafing Online Shop or may be made available some other way. However, we will not know how nor how much until some days after the trade show has ended. We will let you know as soon as we know. Made in Italy Collection – Viva l’Italia! The Italians, how do they do it? How do they create such lush fabrics, which are equal parts trendy and timeless? It’s probably not so important how they do it, but just that they do what they do and that we can each have a bit of that la vita bella at our sewing machines. Plaids remain incredibly popular and these luscious tonal play are sure to inspire those among us, who are looking for a bit more of a sewing challenge beyond children’s clothing and casual knitwear pieces. Trying your hand at tailoring with suiting fabrics of this quality is pure joy. 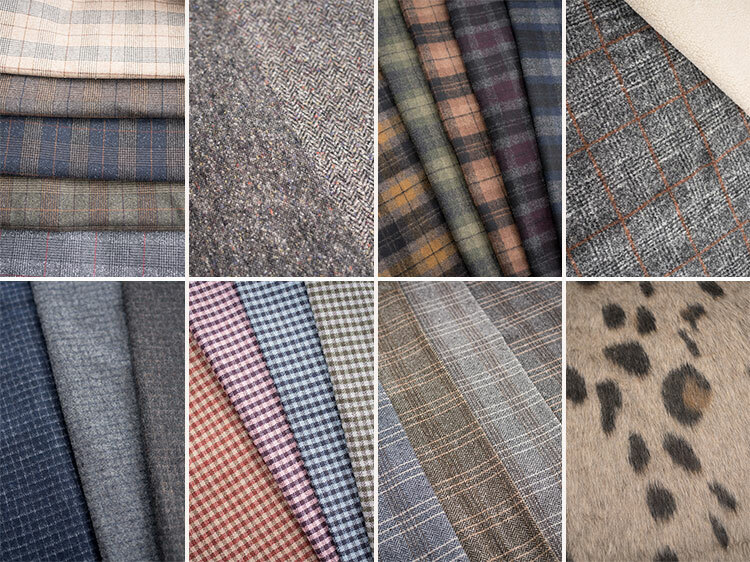 We think you’ll love the herringbone tweeds, heathered suitings, and plaids and checks of varying size and contrast. We also have a really lush faux fur and fashion shearling to add some really fab flare. 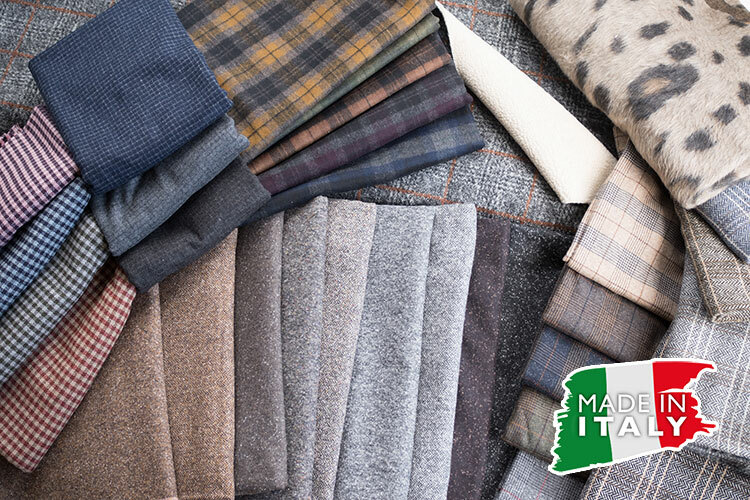 Be sure to check out our new Made in Italy Collection of high quality wool fashion apparel fabrics at the h+h cologne. Only from Swafing and only at the h+h cologne! 11 new „Wavy Stripes“ from lycklig design! This total fan favourite comes to you in a rainbow of new colourways. Whether you choose dreamy summer hues on a white background or bold contrast on black, a rainbow of color or modern muted tone-in-tone greys, there is a wave here for everybody to surf. Knit jersey; STANDARD 100 by OEKO-TEX® certified. Available exclusively at the h+h cologne. Delivery slated for July 2019! 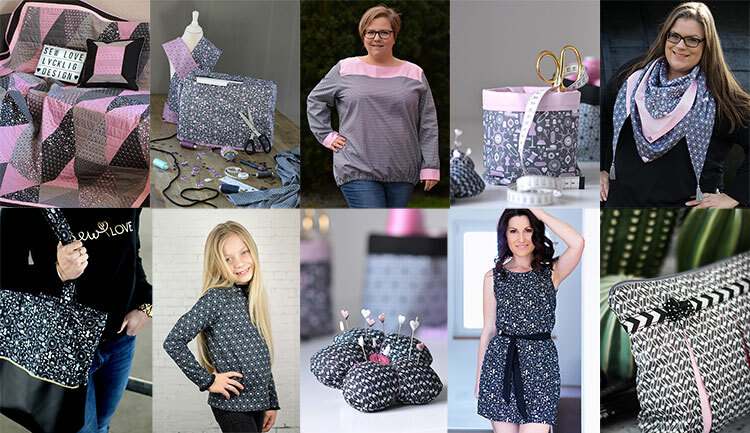 lycklig design’s newest cotton woven collection “Sew Love” is dedicated to our shared sewing passion: Sewing notions of all sorts in a dainty, whimsical print on the highest quality cotton poplin in grey/pink/black/white colourways. The perfect fabric for stitching up storage totes, table fashions, window treatments, or how about a pretty tailored blouse to show the world both your sewing skills and sewing passion? For many of us, sewing is about the best hobby there is in the world. Berit Winter understands how much sewing means to us and has created a pretty new fabric collection just for us. The amazing thing about a piece of fabric is that every sewist will look at it and have a different idea for it. For some, a cut of fabric just screams to be made into a new quilt, while the sewist next to her sees new window treatments in her sewing room and the sewist next to her sees a fun and flirty skirt: The same thing, but imagined in a completely different way. Berit Winter understands this all too well and has dedicated this the “Sew Love” collection to that creative mindset. Sewing brings two pieces of material together with a common thread; our love of sewing is a common thread that brings us together. This fabric collection features one design in which the sewing notions are the ones we recognize immediately, while other designs are a little more graphic and not immediately recognizable. Did you see the little wheels of sewing pins? Of course you did! But you’re not like everybody else–you sew, so you know! Choose from pretty grey and pink or bold black and white. Or choose both! 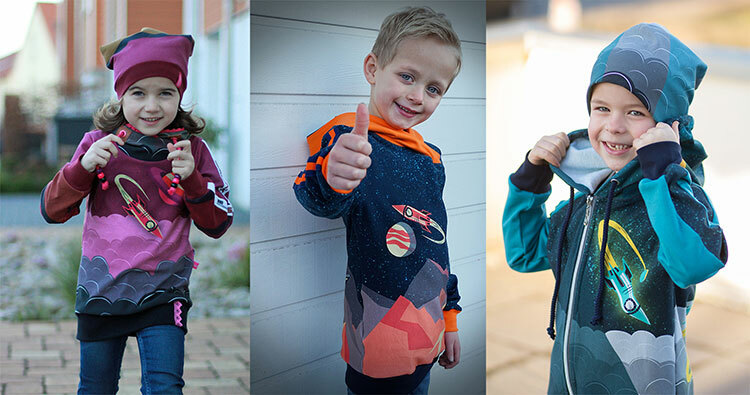 You can sew whatever you love with “Sew Love” from lycklig design. 100% cotton woven; STANDARD 100 by OEKO-TEX® certified. Available exclusively at the h+h cologne. Delivery slated for June, 2019. Wild Shadows” French terry with polar bears! Get ready for another installation from the series of megahit “Wild Shadows” French terry fabrics from lycklig design–this time with polar bears! These magnificent creatures are quite at home in the baren and beautiful landscape of icy blue cliffs beneath a crystal clear arctic night sky full of stars. Berit Winter has reimagined her very popular border prints with white silhouettes instead of black, moving this time from polar white to midnight dark across the entire width of the fabric. The design lends a great deal of depth perception, making it seem almost 3D. The material is marked along the selvedge at the beginning of each repeat. Each repeat measures approximately one meter. For those wishing more or less yardage than full meter lengths may disregard these markings. This 95% cotton/5% Elastane/Lycra sweatshirt jersey features an unbrushed reverse and is STANDARD 100 by OEKO-TEX® certified. Available exclusively at the h+h cologne. Delivery slated for July, 2019. Nelli Simböck spent many hours of her childhood in Vienna reading classic science fiction in classic comic book store. From the crinkly pages Nelli’s imagination soared beyond the Imperial City to empires far beyond the Milky Way. 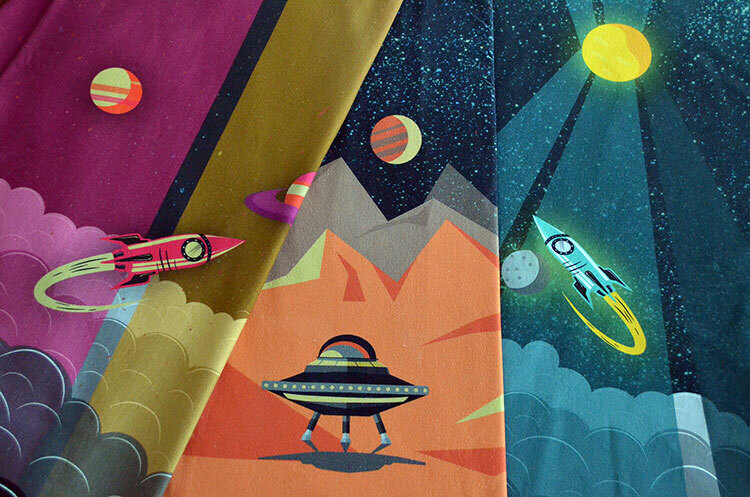 Today, bienvendido colorado takes us along on an adventure to unexplored worlds with these retro prints featuring rocket ships, flying saucers and celestial bodies–designs sure to please the future space explorers in your world. In space, there is no up, no down. Same goes for these fabrics: Depending on how you place your pattern pieces on the design, which stretches across the entire width of the material, you can travel in any direction you desire and explore creatively any which way you like. “Galaxy Tales” is a brushed sweatshirt jersey with a very pleasant weight of 290 g/m². Rocket ships, flying saucers and planets brust from ominous cloud formations or zoom above fascinating landscape. The opposite selvedge features a plain space scape, which works really well for sleeves and/or back pieces. Or avoid the spaceships altogether and feature a space scapes on a pair of lounge pants for your bigger kids. The design repeats approximately all 100 cm and runs the entire 160 cm width of the fabric. “Galaxy Tales” sweatshirt jersey is available in teal blue, orange/putty, and honeysuckle/ochre gold colourways. “Galaxy Tales” Brushed Sweatshirt Jersey. STANDARD 100 by OEKO-TEX® certified. Available exclusively at the h+h cologne. Delivery slated for August. You’re going to love the versatility of this high-tech sci-fi fabric. The print is designed to be used in patches on other jackets. Cut out the groovy stripe pieces as well and place them in crazy ways, as well! 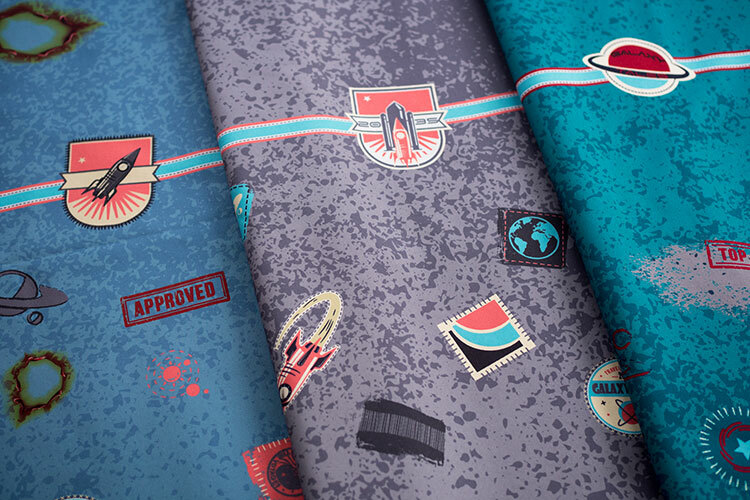 Each length of material features a chevron stripe area, a middle piece featuring the retro sci-fi motifs and then an area … hold on, Captain, we might be heading right toward an asteroid field! Or black holes? Either way, let’s take a closer look! “Galaxy Patches” also permits the sewist to place her pattern pieces at will to create a look quite unique to her vision. The pattern repeat extends the entire length of the fabric of 145 cm and repeats every 90 cm. There are no hard breaks in the pattern repeat and the horizontal stripes runs seamlessly the entire length of the material. 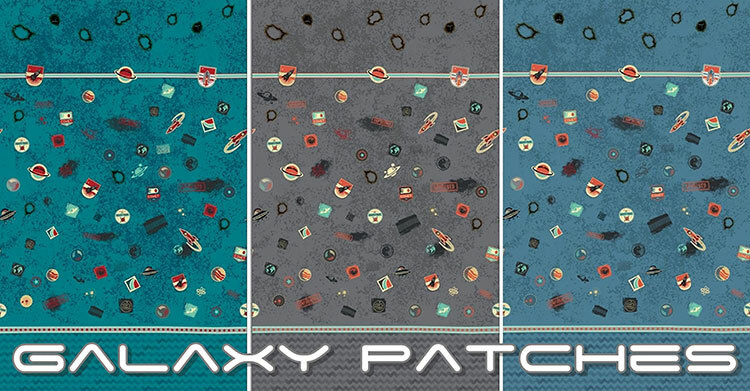 “Galaxy Patches” NANO-Softshell. NANO-Softshell, STANDARD 100 by OEKO-TEX® certified. Available exclusively at the h+h cologne. Delivery slated for September. 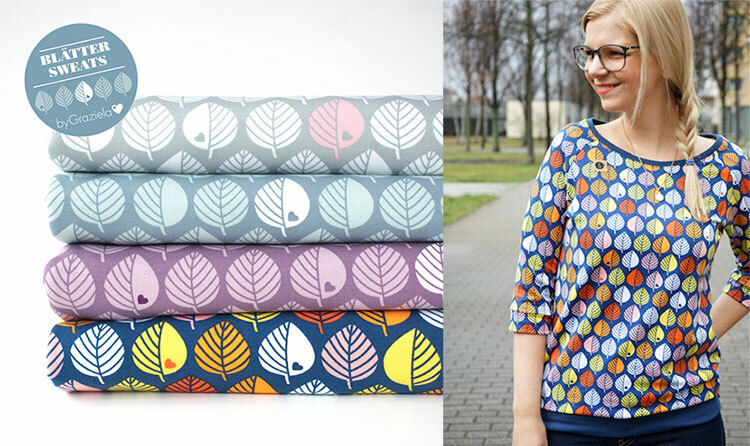 All-time favourite designs in pretty new colour palettes! byGraziela’s “Blätter” (“leaves”) sweatshirt jersey remains at the top of the charts. This sweatshirt jersey print has to be one of your absolute all-time favourites. It just flies off the shelves is and immediately tucked away into fabric stashes, only to be brought out for very special sewing projects. We have three new colourways of “Blätter” available exclusively at the h+h Cologne. Stop on by our stand and be sure to order yours! This design featuring the iconic leaves with a dainty heart comes to you in grey/pink, mint green and lavendar, as well as two new tone-in-tone colourways. Do like things a bit more colourful? Then the blue background with yellow, orange and pink is just perfect for you. This 95% cotton/5% Elastane/Lycra blend fabric features a brushed reverse and is STANDARD 100 by OEKO-TEX® certified. Available exclusively for pre-order at the h+h cologne. Delivery slated for September. Pillow Party is back! 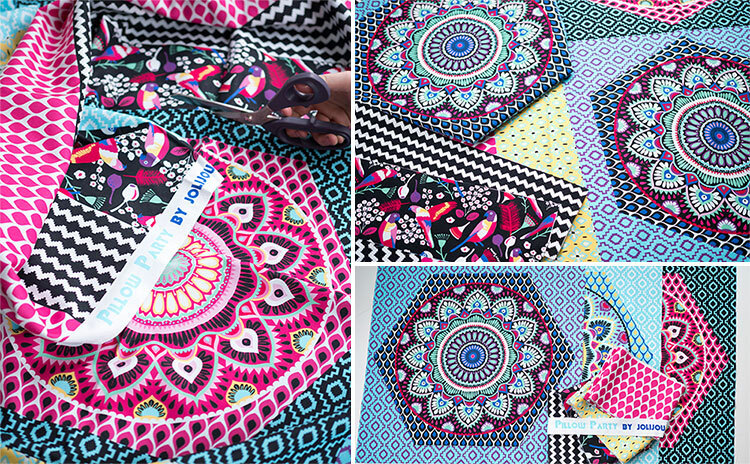 One of the absolute fan favourites from last year’s trade show was Jolijou’s Pillow Party. 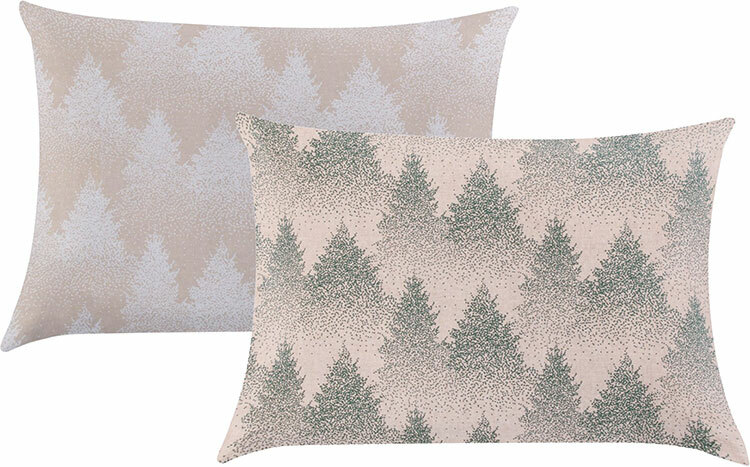 These throw pillow panels sold like hotcakes and so we’d like to throw another Pillow Party this year! 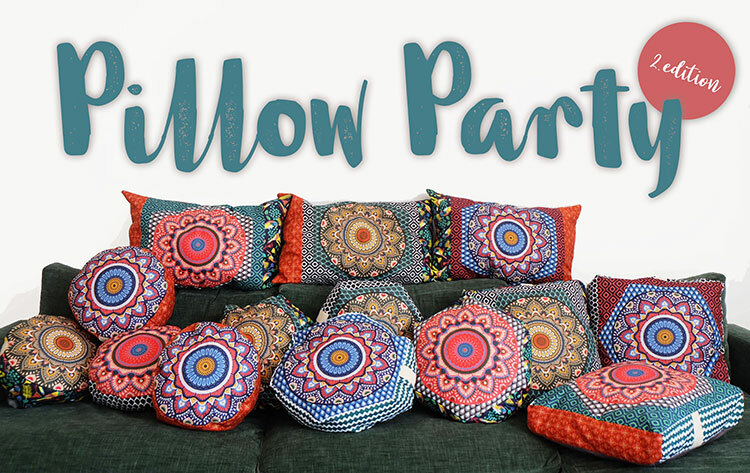 Clear off the couch and make room for the second edition of Pillow Party in the bright jewel tones of last year and a new, somewhat more muted terracotta colourway. 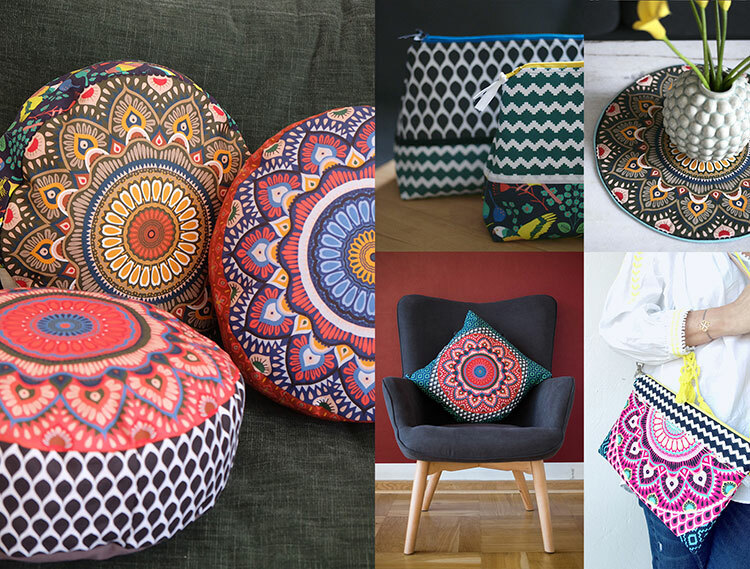 These pillows are stitched up lickety-split and add a bright, bold, boho kick to any living space. Mix several mandalas to create reversible pillows or choose a perfectly colour-match Swafing Basic to contrast the reverse. Use the railroaded stripes to create borders or flanges. 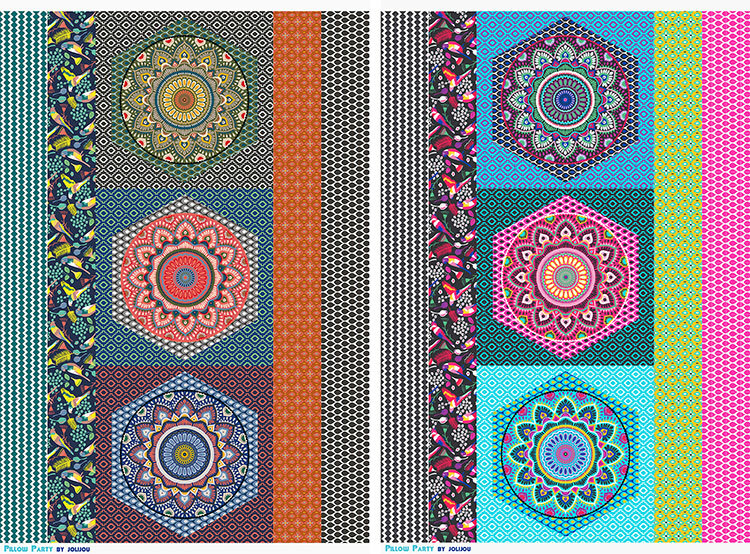 Of course, this fabric also works great for making yoga pillows, handbags and shopping bags. Add ball fringe, brush fringe, tassels, ribbons or welting to add an extra-special touch. Pillow Party Canvas, STANDARD 100 by OEKO-TEX® certified. Available exclusively at the h+h cologne. Delivery slated for July. 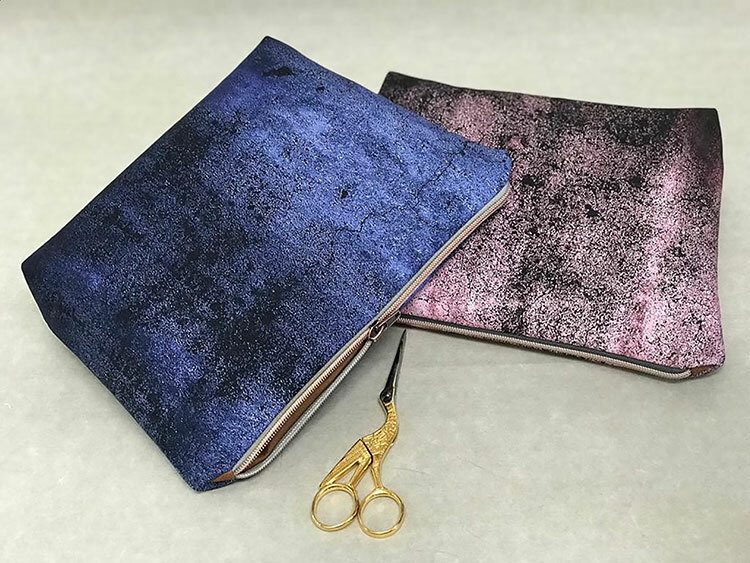 In her newest collection, Sandra Prüßmeier presents a harmoniously blended collection, which matches like a dream with her Fall/Winter 2019/20 collection “See You Soon”. 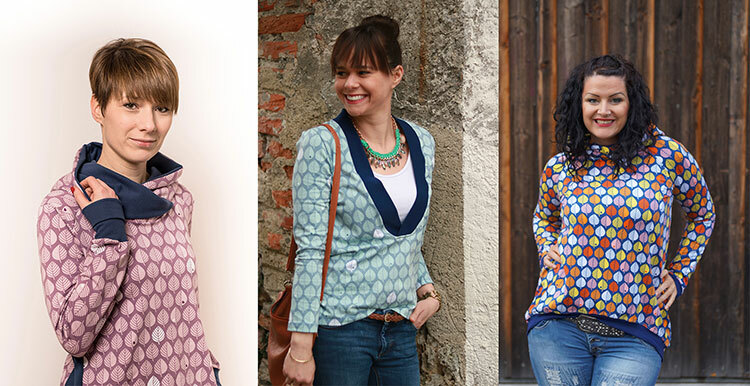 These modern prints feature a pastel background of light blue, pink or green with bold contrasting designs. Diamond patterns are having something of a comeback. Lila-Lotta reinterprets an argyle design with broken lines for an updated take on a classic favourite. “Simply” sweatshirt jersey stitched up into pullovers, sporty jackets or loungewear is simply divine. 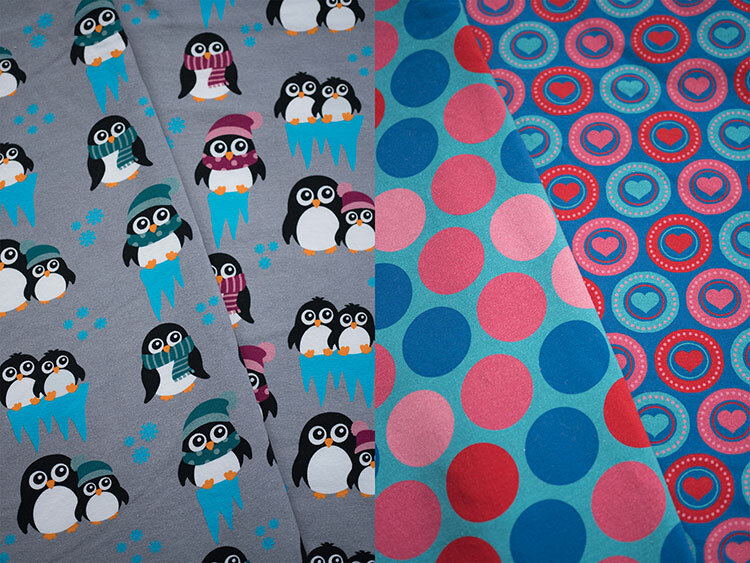 Choose from a dark blue colourway with pink, or medium blue and kiwi green. Jacquard knit jersey “Template” is a bit understated and in that way so much more interesting. The multi-hued diamond shapes are bordered by wide lines. A design which is equal parts brand new and classic, “Template” works well for men, women and children. Or stitch up this textile into throw pillows or couch throws to add a bit of texture and coziness to your living spaces. We love these five beautiful colourways: grey with light blue, pink, kiwi green, dark grey, as well as dark grey with mustard yellow. “Blob” reminds Lila-Lotta on her 80s childhood: Bold designs on a contrasting background are once again in fashion, like, tooootally! Stitch up some great new pieces for the kids or yourself, either alone or combined with matching solids. Coming to you in powder pink or light blue, each with dark blue “Blob”-blobs. “Lightly brushed Sweatshirt Jersey „Simply“, Jacquard knit jersey „Template“ and knit jersey „Blob“ by Lila-Lotta. STANDARD 100 by OEKO-TEX® certified. Available exclusively at the h+h Cologne. Delivery slated for July! 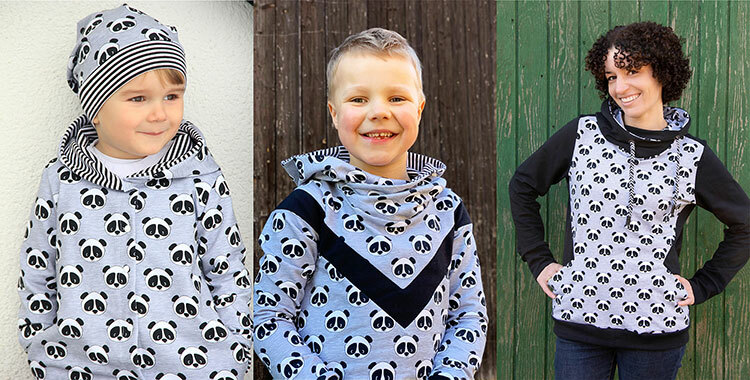 Cherry Picking is coming to us with the sweetest little pandas on unbrushed sweatshirt jersey for kids, teens and the biggest cuddle bears in your family, too! And then she has “Message,” a flowing viscose fabrics featuring Morse code messages on terracotta and pink. And let’s not forget fan favourites “Mr. Greystone” concrete-look and “Mrs. Marblestone” marble-look fabrics, this time on sturdy canvas. Anke Müller loves pandas! And who can resist a panda’s sweet expression and easy-going disposition? This black-and-white cuddle buddy comes to you in heathered grey sweatshirt jersey, just perfect for snuggly hoodies, casual dresses, tops, jackets and loungewear. And, as you’ve come to expect from from us, “Panda” French terry will mix and match with the entire world of Swafing Basics. This unbrushed 95% cotton/5% Elastane/Lycra blend sweatshirt jersey is STANDARD 100 by OEKO-TEX® certified. Available for pre-order at the h+h cologne. Delivery slated for mid-April. Electronic messaging systems were one of the first inventions to make use of the amazing new discovery of capturing electricity. Our smartphones and all their magical wonders are but the great-grandchildren of the Morse code machines from 150 years ago: Whether Facetime or dots and dashes, we humans have a deep need to communicate with each other over distance. Anke Müller’s “Message” fabric is a material reflection in dots and dashes of this very need. This flowy viscose woven comes to you in two fashion-forward colourways: terracotta/white and pink/white. 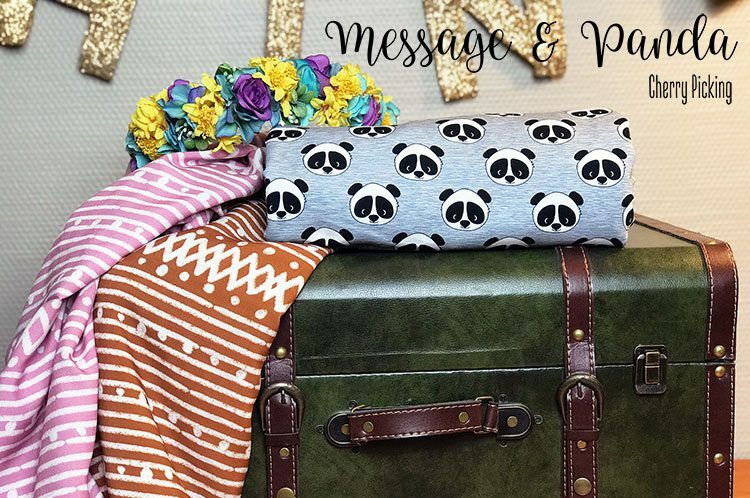 Send a signal to the world of your true you are in a breezy skirt, flirty blouse, or elegant casual dress of your own creation sewn from Cherry Picking’s new “Message”. 100% viscose, STANDARD 100 by OEKO-TEX® certified. Available for pre-order at the h+h cologne. Delivery slated for mid-April. 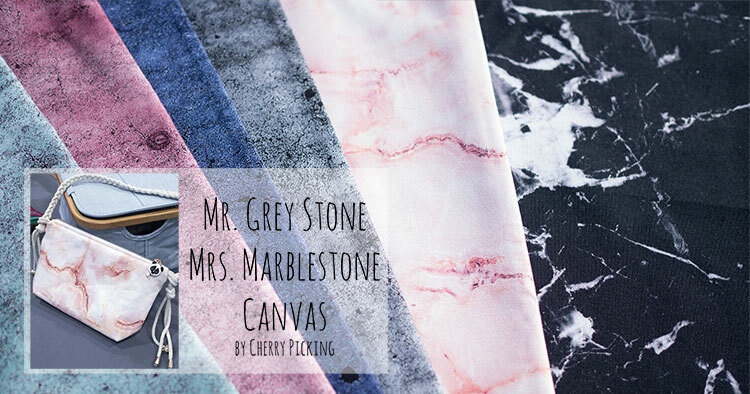 Building the tremendous success of Cherry Picking’s line of fabrics in the look of marble and concrete, we are offering more “Mr Grey Stone” and “Mrs Marblestone”. The fascinating juxtaposition of something that looks so hard, but in reality is soft has been all over interior design for several years with little letup in sight! 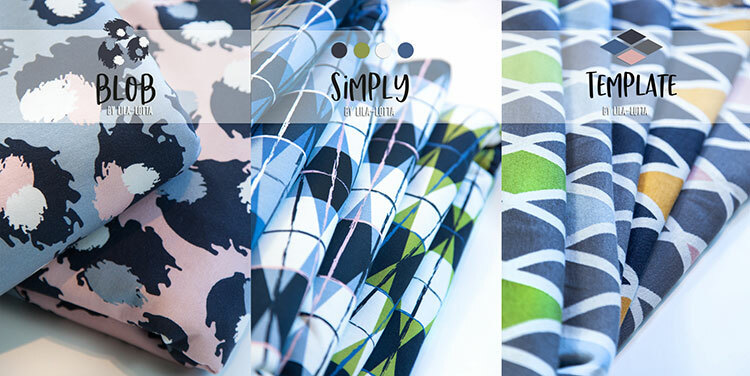 We received so many requests for Anke Müller’s look of stone apparel fabrics to be made into a sturdier version suitable for décor that we just had to agree! And so we’re bringing you these prints on sturdy canvas in six marvelous colourways. The print extends across the entire width of the fabric for a most realistic appearance. Marble exhibits surface patterns in the forms of swirls, veins, and speckles in various shades that make each piece beautiful and unique. These veining patterns are the result of numerous mineral-based impurities: In other words, marble’s imperfections make it perfect–just like you! “Mrs Marblestone” canvas comes to you in black and pink versions. The look of distressed concrete in four colours: Grey, mint green, dusty rose and dark blue, each with bits of black. High quality, digitally printed cotton Canvas, STANDARD 100 by OEKO-TEX® certified. Available at the h+h cologne. Delivery slated for April 2019. 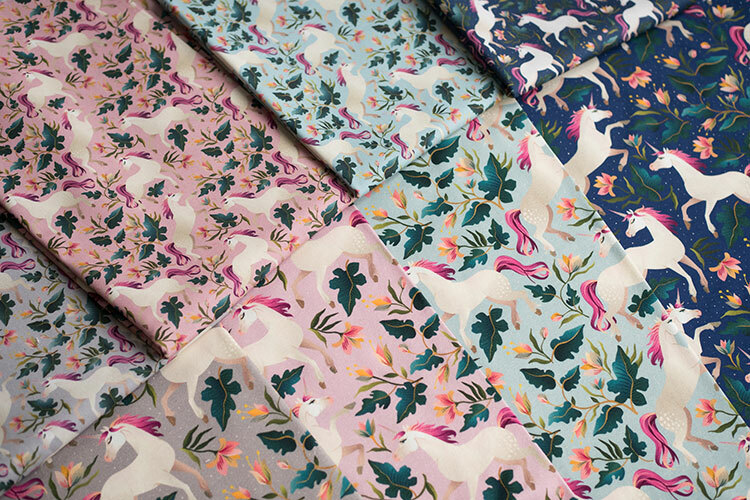 When we first introduced this pretty design, you told us you wanted these playful, prancing unicorns on more varieties of fabric. So come on over to the h+h cologne, where we will have these unicorns on mint green, pink, grey and navy blue on both knit jersey “Mattes” and cotton woven “Kim”. In Germany, starting elementary school is a big thing and parents present their kids with a large cardboard cone filled with toys, sweets or school supplies. 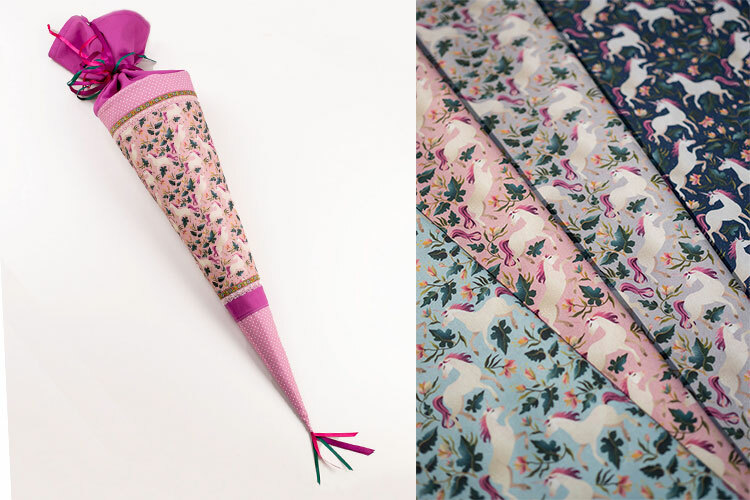 Who´d like to have this cute Unicorn „Schultüte“ or a matching dress? Delivery in April while supplies last! STANDARD 100 by OEKO-TEX® certified. We fell in love with these fabrics at first sight! And popular author Pauline Dohmen couldn’t resist these pretty rosebud prints for her new book “Nähen mit Webwaren – Klimperkleine Kinderkleidung” (“Sewing with Wovens”; available only in German). The sparkly gold details, dainty roses and modern eucalyptus leaves are realistically printed in digital quality. Make room in your fabric stash for the colourways dark grey, dark blue, mint green, bordeaux and dusty rose. Delivery in April, while supplies last. STANDARD 100 by OEKO-TEX® certified. A marvelously soft knit jersey in the hard look of stone. 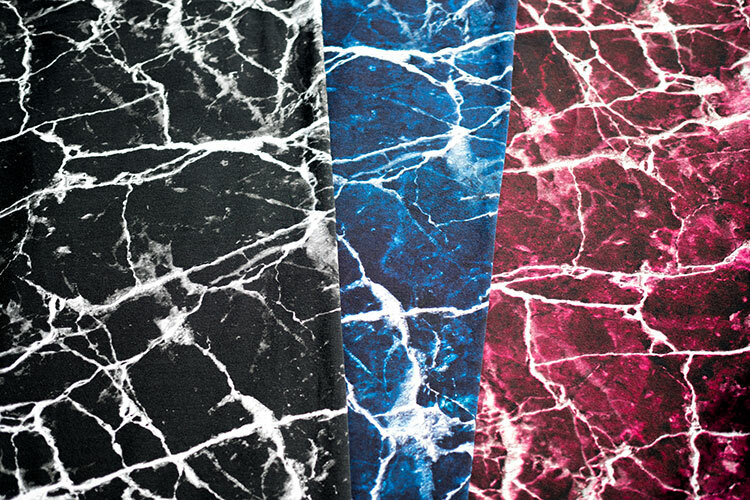 This very popular marble-look knit jersey comes to you in three colourways: Black, dark blue and bordeaux red. This 95% cotton/5% Lycra/Elastane blend is STANDARD 100 by OEKO-TEX® certified. Delivery is slated for September. Whether at the beach, at the pool or at your local swimming hole, brand new activewear fabric “SANTOS” will have you stitching up great new swimwear in no time! And don’t forget workout leggings and tops: This fabric moves and recovers with every Bharadvaja’s twist and barbell squat. We’re presenting this marvelous polymer fabric with 10% Elastane/Lycra in time for the h+h cologne. Go ahead! Give it a try: Sewing your own swimwear and activewear is easier than you think! 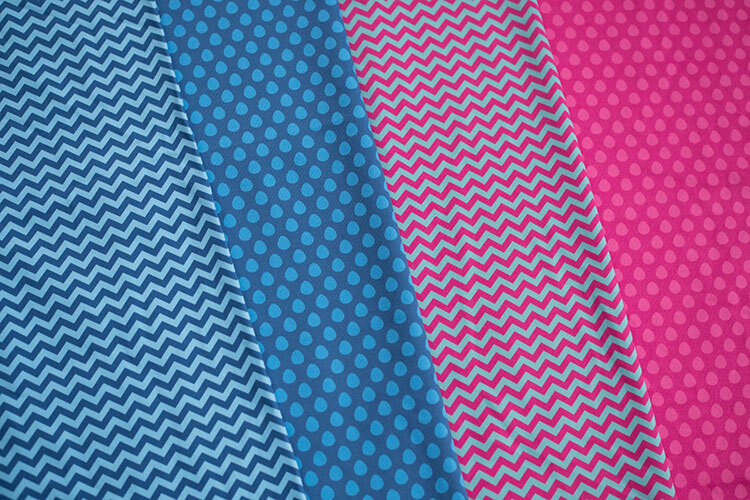 We have SANTOS with chevron stripes in turquoise/pink and blue/light blue, as well as with colour drops in pink and blue. These two designs mix and match really well together for even more possibilities! Expected delivery mid-April, while supplies last. We have many new fall and winter brushed sweatshirt fabrics on offer at the h+h cologne. Delivery slated for September. 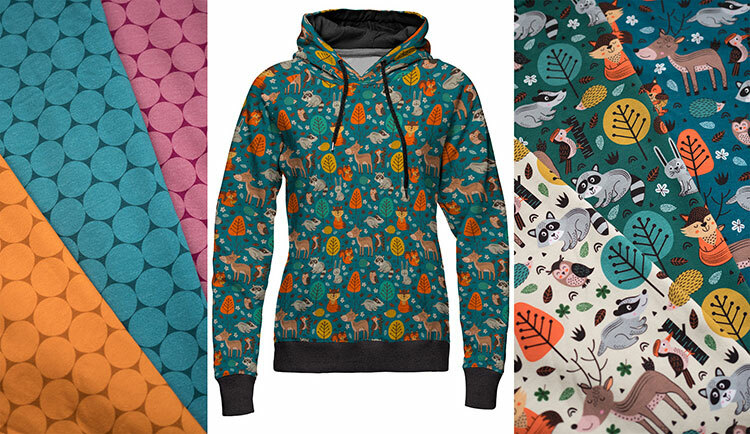 Wiley foxes, silly squirrels, watchful owls, dainty deer and many other forest friends are lovingly illustrated on this cozy sweatshirt jersey. 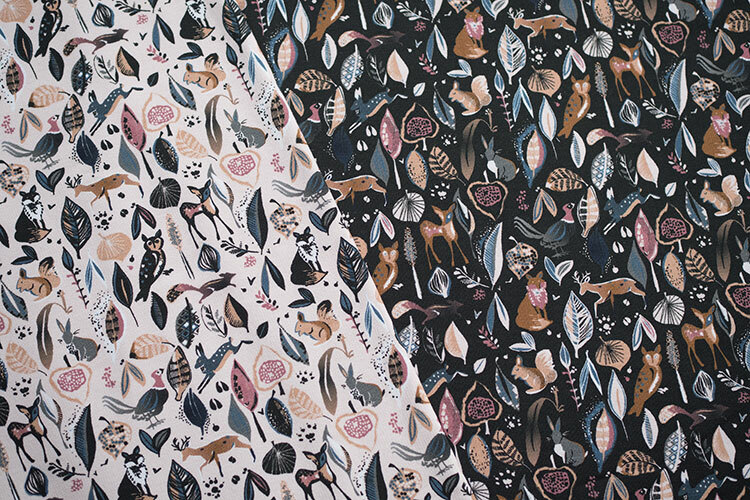 The muted beige and black colourways make these fabrics suitable for kids of all ages. Brushed reverse 95% cotton/5% Lycra/Elastane blend knit sweatshirt jersey. STANDARD 100 by OEKO-TEX® certified. 20 new designs on high quality Swafing sweatshirt jersey! Surely there is the perfect fabric for the dearest darlings on your sewing list. May we suggest these adorable penguins and fun forest dwellers? Or what about these big dots? 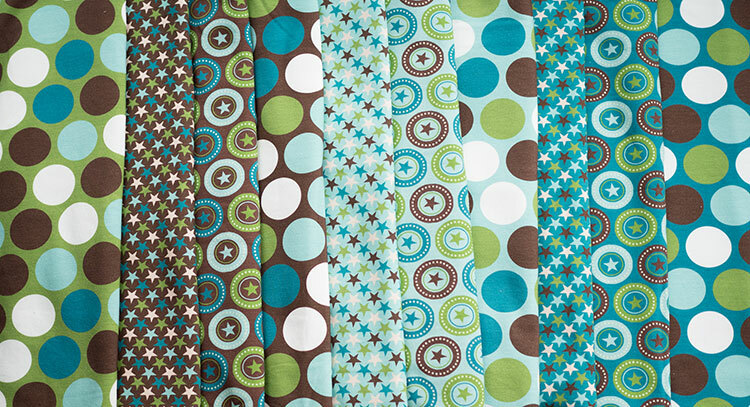 The tone-in-tone designs make a great base fabric from which to build your creative designs. 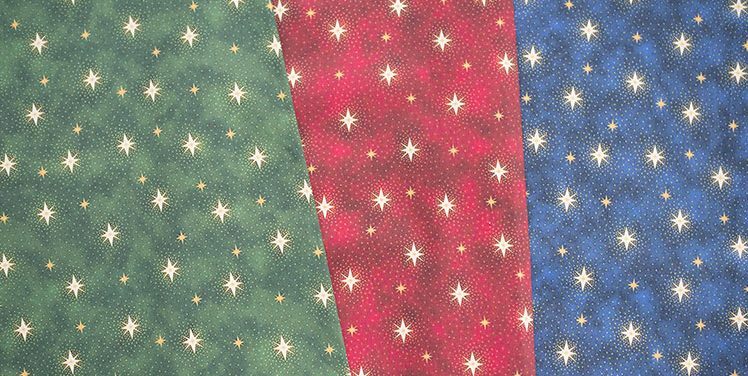 And we are also on the lookout for fabrics that would be especially suited to boys, such as these star and circle designs. Choose from small- and medium-sized stars and bold dots in braun, teal, turquoise and bright green. This comfy, cozy sweatshirt jersey variety is a 95% cotton/5% Lycra/Elastane blend and is STANDARD 100 by OEKO-TEX® certified. It’s back! Worsted wool “Naomi”! We’ve brought back a real Swafing classic in brand new colours. Come experience 19 lush colours of our very versatile “Naomi” worsted wool at the h+h cologne. In addition to the irreplaceable basics like navy blue, heathered grey and black, be sure to stock up on the season’s trendiest tones like mustard yellow, dusty rose, mint green and terracotta. Take a look at the two-tone ponchos we stitched up lickety-split. We’ll show you how to sew your own on our Swafing Blog, once we’re back from the h+h cologne. “Naomi” is a wonderful material that works well for jackets, caps, handbags, ponchos, even home décor items! Delivery is slated for the end of July. Spring is the time for a bit of planning for the next winter and think about the holiday trends to come. The delivery of these fabrics will be in September, just in time for creative fall and winter sewing days. “Björn” is our great big 2019 cotton woven collection. 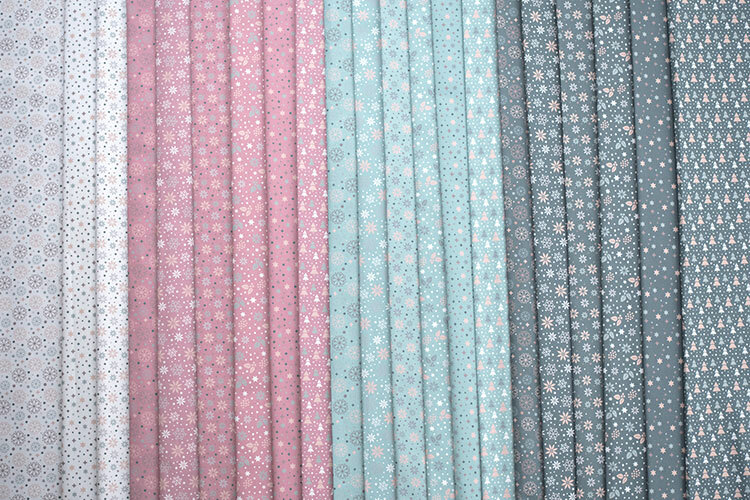 21 different fabrics to mix and match in mint green, dusty rose, grey and white colourways. Dainty snowflakes, stars, polka dots and Christmas trees to stitch up holiday table fashions, throw pillows, blouses and so much more! 100% cotton poplin, STANDARD 100 by OEKO-TEX® certified. Delivery in September. „Weihnachten“ means „Christmas“ in german. It´s also the name of our Classic Christmas designs with sparkling stars in forest green, burgundy red and dark blue. 100% cotton poplin, STANDARD 100 by OEKO-TEX® certified. 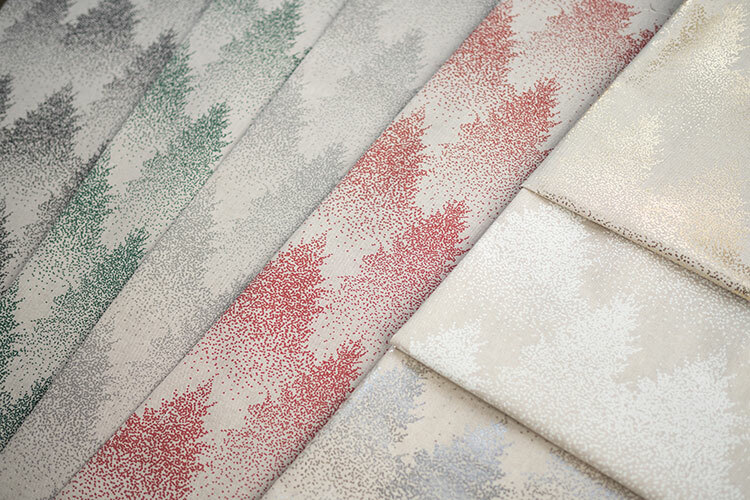 “Franz” and “Josef” are two new linen-look decorator fabrics featuring evergreen forest prints. Just perfect for seasonal throw pillows, table fashions, totes and gifts! “Josef”comes in white, grey, black, red or green on a neutral beige background. “Franz” gets fancy with gold and silver. Decorator fabric, 75% Cotton, 25 % Polyester. Delivery in September! 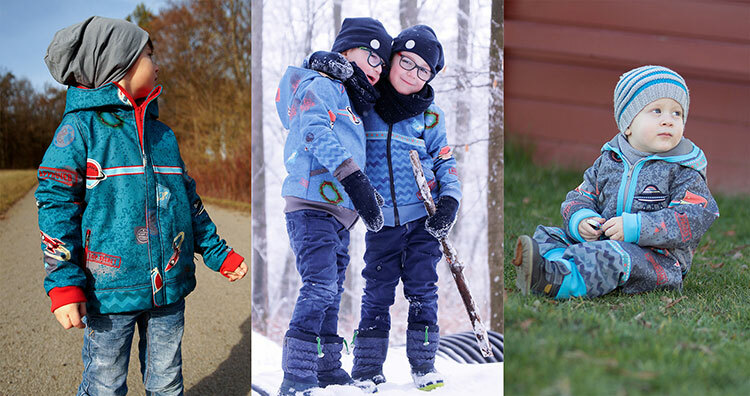 Swafing Fall/Winter-Collection 19/20 – Available for preorder at the h&h cologne fair! 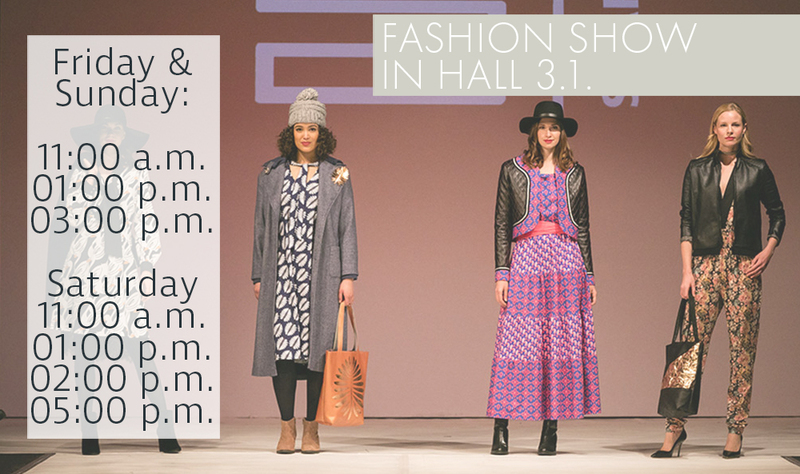 If you’re going to the h+h cologne trade fair, be sure to catch the daily Fashion Show sponsored by the Initiative Handarbeit (“handicraft initiative”)! 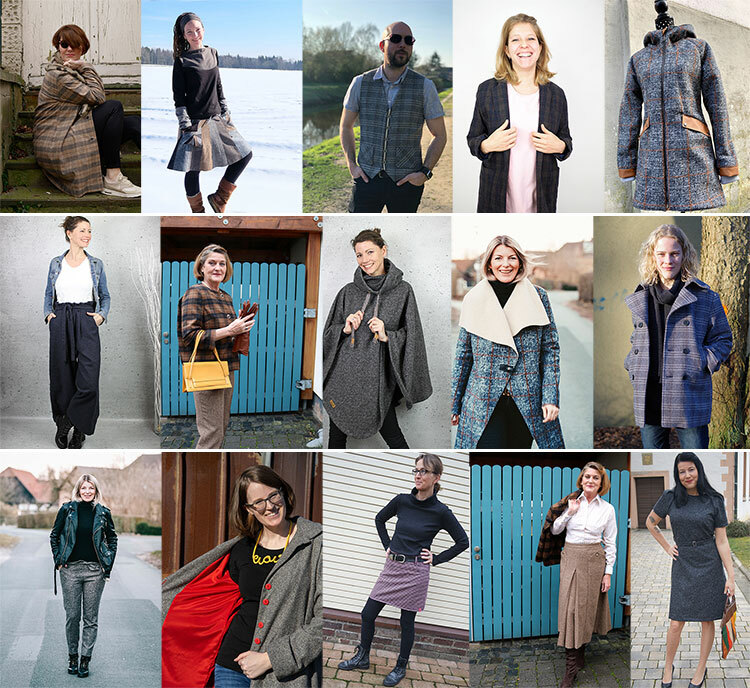 Inspiration for every occasion and all tastes: Fashion designer Anke Müller will present four inspiring looks sewn from Swafing Fall/Winter 19/20 fabrics. Check it out! To support online sales, we will be making promotional images available here as soon as the fair starts. Please note, the images made available for download may only be used for advertisement and promotion of the featured fabrics. The rights to the images remain with the rights holders. Kindly refer to our Terms and Conditions for the use of Swafing promotional images. Many of the highlights featured in this newsletter will only be made available at the h+h cologne trade show. We will not be taking telephone or email orders for the h+h cologne highlight fabrics. Any remaining batch quantities, which are not ordered at the h+h cologne may be made available for sale in the Swafing Online Shop or elsewhere. We will know what will be available only after the trade show. We will notify you of any such quantities of h+h cologne highlight fabrics, which can be ordered online. Thanks to our wonderful test sewist!